Toward the end of November, a sad announcement came from Becky Burguess of 2 Dogs Long. After almost 19 years, she had made the hard decision to retire from breeding dachshunds. Done right, breeding dogs is a tremendously difficult task, both physically and emotionally. It means long hours, late nights, the pain of holding a small, perfectly formed pup who was still-born, and the even greater pain of losing a pup that you have fought hard to keep alive. We know of no one who has done it more right than Becky, and her husband, Bill. Their sires and dams were treated like family and kept healthy. The pups were well-socialized from birth. In fact, one of the best things about visiting 2 Dogs Long, as we did many times, was daily pup socialization sessions. Everyone should have the chance to be mobbed by a pack of wiener pups. We should emphasize that only the breeding portion of the business is closing. 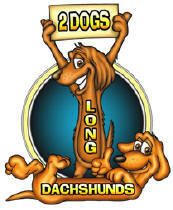 The 2 Dogs Long Store remains online and open for business. There you will find most of the supplies your dogs could want or need, not to mention beautiful cards that Becky makes by hand and wooden cremation urns that Bill turns out in his workshop. We salute Becky and Bill, we hail the work they've done, and we wish them the best as they retire. Zoe helped me care for my critically care brother four years ago, and now my husband with metastatic cancer. She immediately knows when he is not doing well and lays by his side providing comfort and unconditional love. Then there's the hours of endless entertainment she provides... Hunting cats that sneak into our yard, listening for intruders and bolting off after them in a frenzie. She is just such a clown. She is a wonderful dog. Thank you, Becky and Bill, for such a beautiful little dog.